I did not plan on going to several ballparks this year after going to all 30 last season, but a little over halfway through the season I have been to 3 (Dbacks Opening Day, Nats @ Cubs in April, and then Petco park). 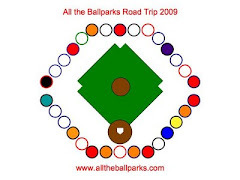 Only the Dbacks Opening Day game this season was the three of us, but I am going to still keep updating this blog as I visit and revisit various ballparks and baseball things. Mik was definitely baseballed out after last season and only planned to go Dbacks opening day and the Luis Gonzalez bobblehead game coming up in August. However, when I told him that the Dbacks were in San Diego when we were there in July, he happily agreed to go to a game. By the way he also got mad at me for saying I might fit in a Twins game in August to check their new ballpark off the been to list. He called last summer the Summer of Hell, but since he has been to the other 29 current ballparks he thinks he might as well visit the 30th. 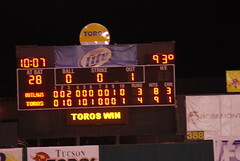 Anyways back to the main point of this post - Dbacks being slaughtered by the Padres on July 16, 2010, at Petco Park. It was a sad game for Mik the Dbacks fan, but it was still kind of exciting. We have been to Petco Park pretty much every year since it has opened, but yet again we got totally lost because we were sitting in the new All You Can Eat section (not as good as last year and will report in a Mik Food Scrapbook post later). Petco Park is overall a nice ballpark if you sit in the right parts (i.e. not next to the building), but it is so dang confusing (see my post about getting lost in 2008). Just like in 2008, we wandered in circles for a while, but this time we ended up with a very helpful usher, who was manning the elevator priority, that actually wandered with us some more and eventually got us to the section. He never works the side of the park we were sitting and even he was confused and asked several other ushers before we got to the place. It was greatly appreciated that he put the effort in and figured it out for us. Unfortunately, we did not get to the ballpark until 30 minutes before the game and by the time we got to our seats we had missed the only run the Dbacks ended up scoring that game. Mik enjoyed seeing his team play, but by the 7th inning he was ready to go (mostly because his team was getting slaughtered). Since it really was his choice of baseball game, I gave in and we left the game in the 8th inning. Amazingly, he did not even take his video game system out of the backpack at this game. I think he is slowly becoming a real baseball spectator and fan, although he will not admit it.